We have a church directory which once you feel you are a regular attender or part of one of our community areas you can become part of and receive a copy of. As we require you to sign to give permission for us to share your information in the directory we cannot do this online. 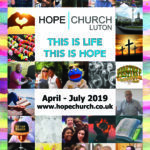 You can however download a form below and either scan it and email it to communications@hopechurch.co.uk or hand it into the offering box or to the church office. Please note we can only process forms which are signed and we feel meet the requirements.